Carolina Zurita, a motivational speaker and writer from Ecuador, has been working tirelessly since news of the massive 7.8 earthquake that hit her home country April 16th. Her goal, to help her compatriots that have been displaced by the disaster. "It hasn't been easy putting together these fundraisers. The hardest part is figuring out how we're actually going to get the money we raise to the people who need it and what is the best way to use the money. Luckily, we found a really great group currently working in Ecuador to help the people in need," said Ms Zurita as she tells me about the local efforts her and a group of Ecuadorians in Shenzhen are spearheading. Poste Rojo is a group of volunteers that are building houses and providing food rations and safety kits to the earthquake victims in Ecuador. They are currently distributing 4,000 rations per day. For each 9650.46 USD raised they can build a house that will last 25 years. 2000USD also provides 200 food kits. Here is a video they've put together showing what is happening now. So far Zurita and her friends have raised 4700 RMB through two flea market fundraisers and are hoping to raise 14000USD to build a house and provide 400 food kits. 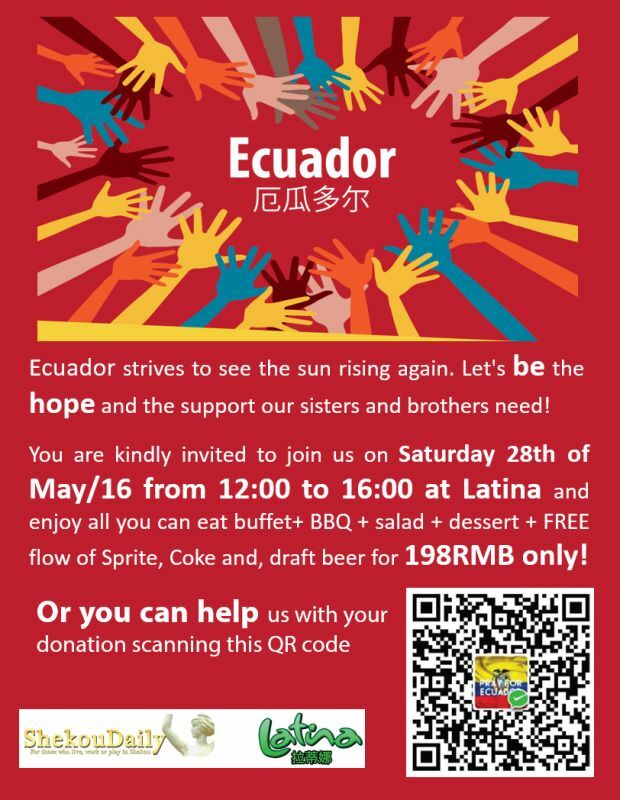 Join them on Saturday May 28th from 12-4pm at Latina Brazilian Restaurant in Sea World for an All-You-Can-Eat BBQ/Buffet with freeflow beer and soft drinks for just 198 RMB. 25% of the proceeds from the event will go to the fundraising efforts for the earthquake victims. and/or scan the QR Code in the flyer below to send money.